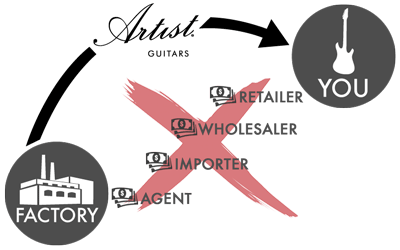 "Why should you buy from us at Artist Guitars? It's really quite simple. You'll get lower prices for equal (or better) quality guitars, drums and accessories." We are on a mission to bring affordable guitars to everyday people and cut out the middle-man. That's why we choose to only offer our guitars online. We are committed to giving you the lowest prices and offering an alternative to paying over-the-top prices for guitars… Artist Guitars started because I wanted to sell the best value guitars I could to you. I found it frustrating that improvements I wanted to make to my designs just weren't possible due to the price pressures of working for a wholesaler. When you buy products from a traditional retail outlet they have often been marked-up up to 4 times. The retailer buys from a wholesaler, the wholesaler buys from a brand, and then the brand buys from a factory. We buy direct from the factory, and sell it straight to you over the internet, so you can get the best possible price and value. Our showroom in Sydney is open to the public, where you're welcome to drop by our warehouse and have a look at our great range of instruments and accessories... but unlike traditional music instrument shops we believe you'll be fully satisfied with our products and that's why we offer 100 Days Free Returns. 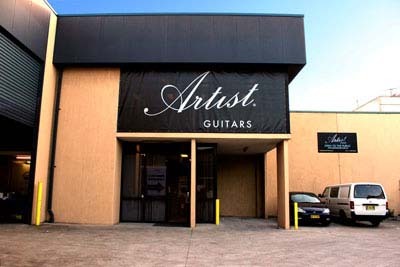 At Artist Guitars we pride ourselves on delivering great quality instruments. Each guitar endures rigorous testing and scrutinising in the development and prototype stages, to bring it to a level where we are confident that the guitar you receive is the best it can be. All our guitars are set up in the factory to a standard that suits beginners, though they are constructed in a way that allows you to easily adjust to suit your own playing style. Our Quality Control team, headed by Leo, works closely with the factory in China to identify any issues in the way guitars are manufactured, set up, handled and packaged. You can see for yourself all the guitars that are rejected, due to our scrupulous checks, are all sold in our Bargain Bin category. As you'll see most of these guitars are factory seconds due to some kind of defect identified in Quality Control Checks. We treat this process very seriously because it enables us to develop better production and handling techniques and reduce the number of Factory Seconds. 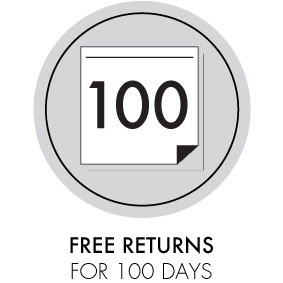 We have so much confidence in the quality of our products that we offer 100 Days Free Returns. 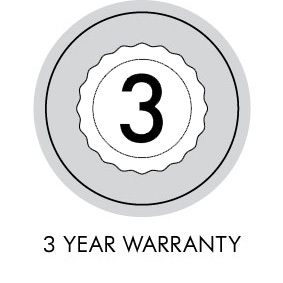 Our instruments and accessories are also backed by a 3-year warranty. If you do have any problems with your guitar after purchase feel free to contact us. 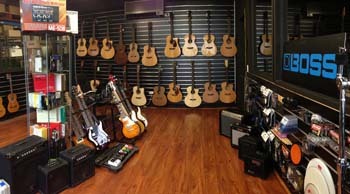 In a music store, most instruments below $1000 retail are manufactured in China (as it seems is everything these days!). We have done extensive research to find what we believe is a great quality factory and we work closely with our factory to ensure you get the best guitar in its price range by far. While doing my research I discovered that big name brands typically aim to cut construction costs which results in a sacrifice in the quality of their equipment. You'd be surprised at the type of factory's some big name brands choose to use (It's often disappointing as a guitarist). At Artist Guitars, we choose what we think is the best quality instruments for the best price, and in our opinion, our instruments sound and feel better than most other brands. For example, all our classic guitar models come with a truss rod. No other guitar brand delivers a truss rod in our price range. Some of our guitars use Fishman pre-amps, D'Addario strings, bone nut and saddle, solid tone woods and Wilkinson pick-ups. This level of components is unheard of at this price. It is our passion to bring you the highest quality for the best price that we can! I've always loved guitars. I wanted to be a rock star. But I worked out pretty early it probably wasn't going to happen. (Mind you if you have your own dream of being a rock star then you should go for it!). But I wanted to stay in the industry and find my sweet spot combining the 2 things I loved: music and design. I have over twenty-five years experience in the industry. I've spent seventeen of those years visiting factories, and three of those years actually living in China, visiting multiple factories and teaching the factory technicians how to build a better guitar. There was one factory in particular that I worked with from its inception. Now it is a high-quality instrument manufacturer. This is where Artist Guitars are built. We offer Free Shipping, Free Returns and a 3 Year Warranty. That means there's no risk to you the customer. If you don't like the product you've ordered you can return it to us for a no-strings-attached, 100% refund, or exchange for another product. Check out our Youtube Channel for Product Demos and Reviews. ...And don't get ripped off paying Retail prices any longer!